Novelty: Development of a novel electromagnetic polymer composite material for enhanced anti-fouling effects. Background: Biofouling (bacterial attachment to solid surfaces and colonization) is the main source of bacterial infection and poses potentially harmful impacts on human health. Medical devices, food packaging, and drinking water distribution systems are all susceptible to biofouling. For example, biofouling in an indwelling urinary tract catheter (IUTC) is the cause of 80% of urinary tract infections (UTI), the most common hospital associated infection. Controlling biointerfacial phenomena is crucial and there is a constant need to develop versatile, convenient, and cost effective strategies for rendering surfaces resistant to fouling by proteins, cells, and bacteria. · Self-generated electric voltage via liquid flow reinforces the anti-fouling capability. · Permanent coating that has the surface properties to repel bacteria. · Inexpensive as compared to other anti-fouling materials. The lab tests with the coating on a flat plastic slide installed in a flow cell showed a 70-78% decrease in the initial cell and protein attachment compared with a regular plastic slide. 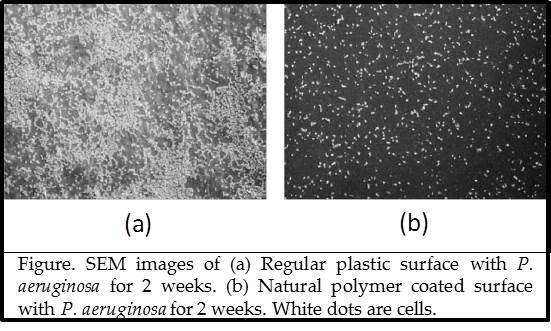 Previously, these researchers demonstrated successful polymerization of cardanol through enzymatic polymerization and the anti-biofouling effect of a surface coating formed by the cross-linked polycardanol .